Dragon fruit is a fairly low-calorie food, containing about 80 calories in one whole raw fruit, according to MyFitnessPal. In comparison, one small orange contains about 65 calories, and a small banana provides about 90 calories, the U.S. Department of Agriculture reports. Dragon fruit contains less than 1 gram of fat per serving, mainly consisting of carbohydrates from natural sugars. For example, one dragon fruit provides about 14 grams of carbohydrates (all of which are from natural sugars) and 1 gram of dietary fiber. One dragon fruit also provides 1 to 2 grams of dietary protein (so it is a low-protein food). Because it's loaded with natural sugars, it can give you a quick pick-me-up when you're feeling droopy or getting ready to work out. Micronutrients (vitamins and minerals) abundant in dragon fruit include potassium, vitamin A and vitamin C. Small amounts of iron and calcium are also present, but vitamin C and potassium are the main micronutrients in dragon fruit. One fresh dragon fruit contains about 300 milligrams of potassium, and provides 44 percent of your vitamin C daily value (DV), 14 percent of vitamin A DV, 2 percent of calcium DV, and 1 percent of your iron DV (according to MyFitnessPal). Compared with an orange, potassium and vitamin A content is fairly similar, but oranges (and kiwi fruit) appear to be slightly higher in vitamin C. Dragon fruit also contains a small amount of dietary sodium, making it a good choice for post-workout nourishment. Adding fresh fruit to your daily meal plan is always a heart-healthy idea because fruit is generally fairly low in calories and fat and contains dietary fiber. Dragon fruit may provide additional health benefits, but more research is needed. An animal study published in 2010 in Pharmacognosy Research found dragon fruit extract appears to control oxidative damage, decrease aortic (heart) damage, and works as an antioxidant in diabetic rats. 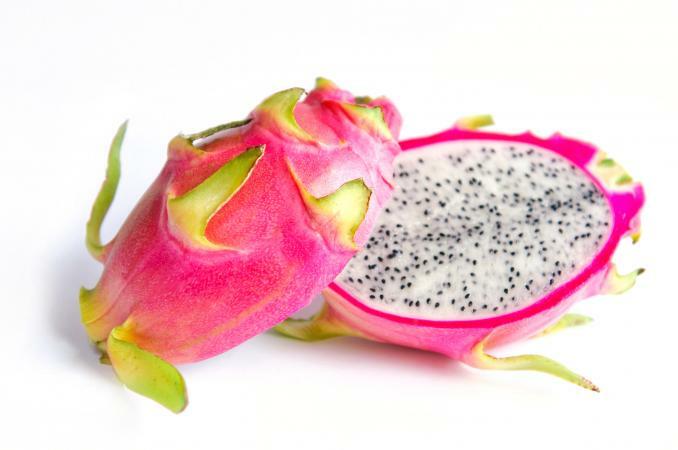 Eating dragon fruit puts you well on your way to meeting daily potassium goals. One dragon fruit provides you with almost 300 milligrams of potassium, helping you work toward your 4,700 milligram per day requirement. Many Americans fail to get the potassium their body needs to function at its best, but dragon fruit can help you get there. While dragon fruit is similar nutritionally to other citrus fruits, it is eye catching and unique in appearance. So wow dinner guests, family, and friends by adding dragon fruit to fruit salads, grilled fruit skewers, fruit kabobs, dragon fruit smoothies, or dragon fruit frozen sorbet. Or, simply eat dragon fruit by itself, peeled and cut into bite-sized pieces.